The village of Slavětín is located eight kilometres east of Louny. The first record of Slavětín dates back from 1268 when it was assigned to Prague bishopric by Přemysl Otakar II. In the 14th century it was acquired by secular nobility. For almost 200 years Slavětín was in possession of the House of Házmburgs during whose reign art decoration of the Church of St Jakub Větší was created. This one-nave, originally Romanesque church is notable especially by its Gothic frescoes in the presbytary. From the Romanesque part from the 13th century, masonry remnants of the nave with six arched windows have been preserved. In the 14th century the church was extended by a presbytary with pointed windows. Paintings, restored in 1998 belonging to the best preserved complete sets in Bohemia, date back to the second half of the 1370s. The spire at the western facade of the church dates back from 1837, the church was restored in 1881 by J. Mocker. Next to the entrance into the church is Konstantin Biebl´s tomb. Nearby the church, valuable premises of a Baroque parish from between 1753 – 1759 has been preserved. In one of the angles of the triangular village green is a sculptural group of St John of Nepomuk with a Baroque pedestal with statues, set in 1900, created by J. Havel of Slaný. Before the municipality, on the right-hand side of the road in the direction from Veltěže, there is a eight-side Baroque chapel of Visitation of the Blessed Virgin Mary. Konstantin Biebl (1898 – 1951 Praha), a famous Czech poet was born at No. 60 in the municipality. At the northwestern edge of the municipality, under a solitary linden-tree near the railway station, is a menhir called Baba, a stone of ferric sandstone with the height of 1.9 m.
Following a telephone arrangement, you can visit an agrotourist family farm of Mr L. Suchý, who breeds a variety of animals. It is possible to book accommodation in the Hájenka boarding house, with styled dining facilities and a bar. It is open for public from April to October (phone. : +420 415 677 224, +420 606 308 043, www.agropenzion.wz.cz). way-side cross with no date have also been preserved. 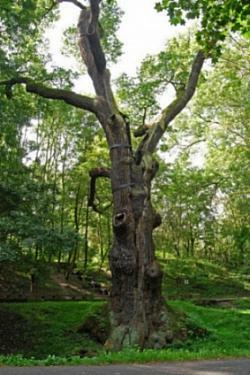 However, most sought-after is the roofed pseudo-Gothic Božena´s well, around which you can descend to an age-old, mighty Oldřich´s oak. The tree is c. 1000 years old with trunk circumference of 745 cm. Three-winged Rococo storeyed chateau, attracting visitors by an oval entrance hall with a staircase, statues and other decoration, is situated opposite the church. Another place of interest, worth mentioning, is Emil Filla´s Gallery, situated in the chateau grounds with the painter´s current art exhibition (Emil Filla – the Bohemian Uplands cycle). 09:30 a.m. - 12:00 a.m.
12:30 p.m. - 04:30 p.m.